Spencer Ackerman over at Wired's Danger Room had a great piece last week called "Sorry, That's Not Really Saddam's Sword You're Buying" which strongly questioned the provenance of a sword auctioned off recently in New Hampshire that purportedly belonged to Saddam Hussein. Based on a closer look at the evidence, however, it appears just as likely that the sword was legitimate. The dirty little secret is that the DoD's practice of permitting war trophies is alive and well. The central thrust of the Danger Room piece relies on the unquestioned assurance of a spokesperson for U.S. Army forces in the Middle East that "[i]f this were an actual Saddam Hussein sword, it would be considered a museum piece and turned back over to the Iraqi government." This assertion, unfortunately, is false both factually and as a matter of U.S. law and policy. Need some evidence? 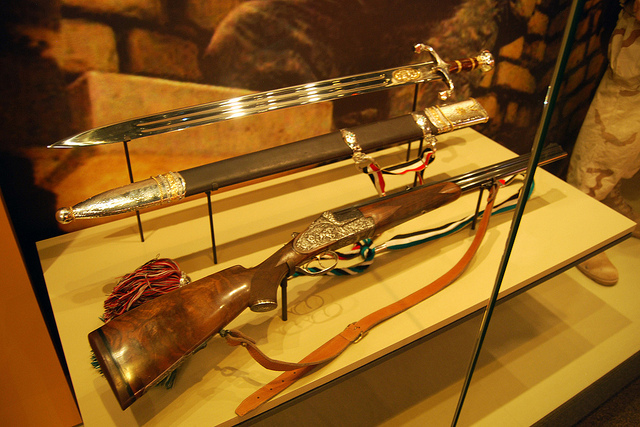 See, as just one example, this exhibit entitled "Saddam Hussein Sword and Rifle" that features an authentic sword captured by the 4th Infantry Division that is on display not in an Iraqi museum, but rather at the U.S. National Infantry Museum in Columbus, Georgia. National Infantry Museum "Hussein Artifacts" "Exhibit: 'Saddam Hussein Sword & Rifle'"
As noted in a military report on legal issues related to Operation Iraqi Freedom, designating "enemy material seized on the battlefield" as "historical artifacts" of U.S. combat operations is standard procedure. The Army's Chief of Military History, in fact, "deploys military and civilian personnel" as recovery teams that are "responsible for identifying, collecting, registering, and returning to the United States all significant historical artifacts, in coordination with unit commanders." This is entirely consistent with the auction house description of the Saddam sword sold in New Hampshire which states that the sword was obtained from Saddam's office within a military command complex in Baghdad and was initially sequestered for possible military history use by the 126th Military History Regiment, which, as noted here, "crossed the berm from Kuwait into Iraq" in March 2003. Moreoever, as I explained in an earlier post on possible criminal charges in the U.K. for importing a buttock from a toppled statute of Saddam, at the time of the invasion the U.S. was not treating property that normally might qualify as museum pieces - such as statutes, paintings, and, perhaps, ceremonial swords - as protected cultural property when that property belonged to, or glorified, Saddam or the Ba'ath Party. Ackerman's Danger Room piece also questioned the authenticity of the sword as an individual "war souvenir." His incredulity is understandable given the reasonable assumption, also implicitly encouraged by the Army's spokesperson, that individual war trophies are a part of the uncivilized past. In relation to the 2003 U.S. invasion of Iraq, the DoD specifically and explicitly pushed this view as part of the larger narrative that the U.S. came to liberate, rather than subjugate, Iraq (see, e.g., the American Forces Press Service,"No War Trophies Allowed from Iraq, Afghanistan" from Dec. 2003). Once again, this is consistent with the auction house description which states that, after the sword's seizure for possible military history purposes and after the sword was subsequently "never claimed by the U.S. government," the seller, who was a military historian, "requested and was granted permission to take the sword home as a souvenir." The belated 2004 implementation of the 1994 war souvenir law may also help explain a final point noted in the Danger Room piece. The auction house description states that the DoD form documenting the sword as a souvenir has the date "March 9, 2003" which arguably undermines its authenticity given that the invasion had not yet started then. The chance that this is a simple date error for the date of the sword's initial seizure, however, becomes more plausible with the added information that the time at which the form was filled out would not have been contemporaneous with the seizure. The form would have been filled out no earlier than February 2004, or almost a year later. The date that was intended was most likely April 9, 2003, the day on which Saddam's statute was iconically pulled down in Firdos square. Of course, this is all just speculation without being able to consult and investigate the actual documentation for the auctioned sword and online auctions are clearly awash with Saddam memorabilia of suspect authenticity. The simple point, however, which may be shocking and hard for some to accept, is that U.S. law and policy would not necessarily preclude individual ownership of captured Iraqi property as war souvenirs nor would it necessarily compel the return of even museum-worthy pieces to Iraq. If the Army wants to claim something different, they can tell it to the Marines.